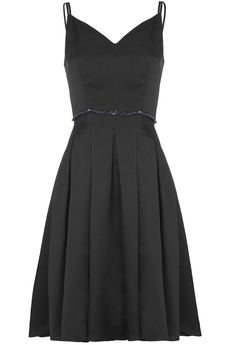 Yumi London, Satin Embellished Party dress is the perfect dress for special occasions. Falling under the knee, is made from satin fluid fabric, with box-pleated flared skirt which is adorned with beads and sequins at the waist and double adjustable straps. Has concealed back zip fastening, it is not lined and is approx. 100cm in length. Winter collection. Composition: 100% Polyester. Color: Black.